Immunofluorescence staining of erythrocytes infected by P. falciparum (ring, trophozoites and schizont stages) using P27-specific polyclonal rabbit sera. P27-specific polyclonal rabbit sera was used to detect Tex1 (green) A) in late ring stages B) in trophozoite stages C) in schizont stages. Nucleus stained with DAPI (blue), transmission picture of the infected red blood cell (DIC) and merged picture of the two signals or the signals merged with transmission picture (merge), Scale bar: 5 mm.Tex1 was detected in punctuated structures within the parasite (A). In trophozoite stages, Tex1 is exported to the host cell cytosol and associates with elongated structures in the cytosol of the infected RBC (B) suggestive of Maurer’s clefts. In schizont stages the protein was much less focused and seemed to associate to the periphery of the host cell in vicinity to the host cell membrane (C).Kulangara C, Luedin S, Dietz O, Rusch S, Frank G, Mueller D, Moser M, Kajava AV, Corradin G, Beck HP, Felger I. 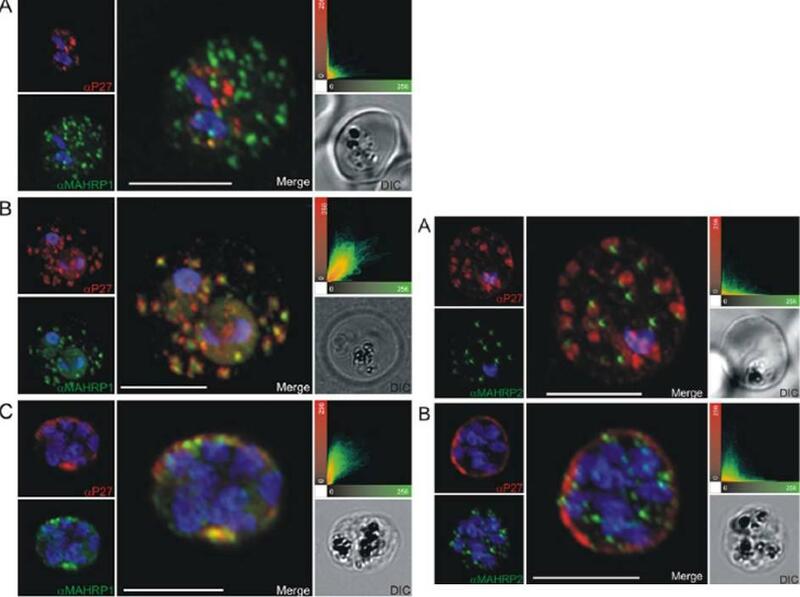 Cell biological characterization of the malaria vaccine candidate trophozoite exported protein 1. PLoS One. 2012;7(10):e46112. Left: Co-localization of Tex1 with MAHRP1. P27-specific polyclonal rabbit sera was used to detect Tex1 (red). Co-localization was performed using MAHRP1 polyclonal mouse sera (green). 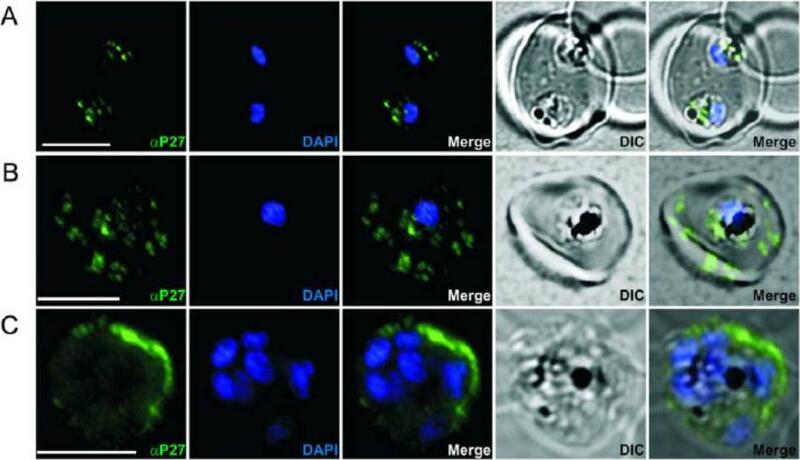 Co-localization was performed in ring stage (A) trophozoite (B) and schizont stage (C) infected RBC. Nuclear DNA was stained with DAPI (blue), Transmission image (DIC), Scale bar: 5 mm.Right: Tex1 localization in trophozoite and schizont stages with respect to newly described structures called tethers. 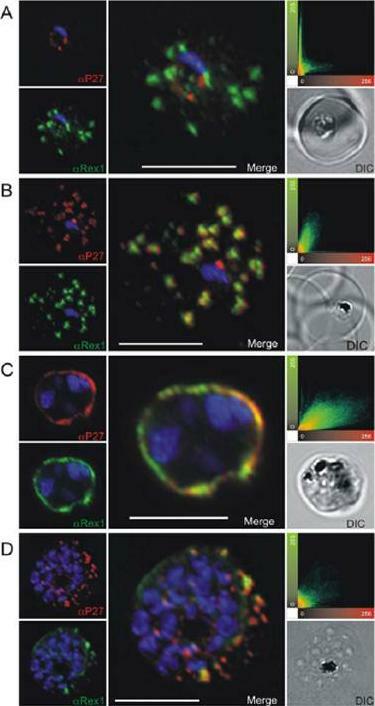 Colocalization of Tex1 (red) with MAHRP2 (green) A) in trophozoite stages and B) in schizont stages. Nuclear DNA was stained with DAPI (blue), Transmission image (DIC), Scale bar: 5 mm.Kulangara C, Luedin S, Dietz O, Rusch S, Frank G, Mueller D, Moser M, Kajava AV, Corradin G, Beck HP, Felger I. Cell biological characterization of the malaria vaccine candidate trophozoite exported protein 1. PLoS One. 2012;7(10):e46112. Co-localization of Tex1 with Rex1. P27-specific polyclonal mouse sera (in red) was used to detect TEX1. Rex1 polyclonal rabbit sera (in green). (A) Ring stage parasites; (B) trophozoite stages; (C) schizont stages. Scatter plots show the degree of co-localization of the Tex1 with Rex1 signal. Nuclear DNA was stained with DAPI (blue), Transmission image (DIC), Scale bar: 5 mm. Based on the co-localization of Tex1 and Rex1, Tex1 is localized to the Maurer’s clefts.Kulangara C, Luedin S, Dietz O, Rusch S, Frank G, Mueller D, Moser M, Kajava AV, Corradin G, Beck HP, Felger I. Cell biological characterization of the malaria vaccine candidate trophozoite exported protein 1. PLoS One. 2012;7(10):e46112.